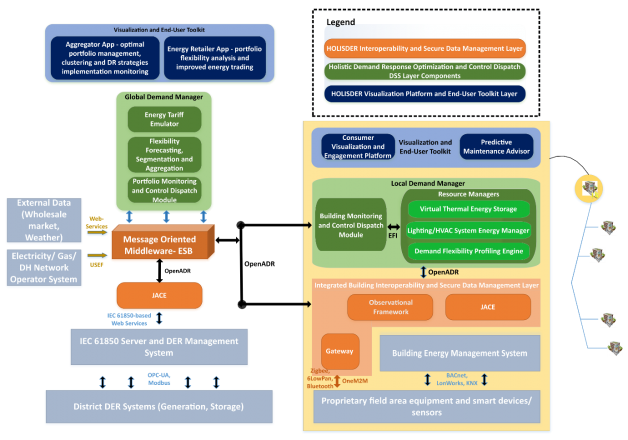 It covers, in a holistic manner, demand-side flexibility into energy markets, by enabling end-to-end interoperability between platforms and devices and participation of end-users as active stakeholders (see Figure 1). Figure 1. HOLISDER Framework Architecture. The Interoperability and Secure Data Management Layer ensures technical and semantic interoperability across the DR value chain, through the utilization and, if necessary, extension of well-established open standards and protocols. The layer consists of four main components: the JACE, the Message Oriented Middleware, the gateway and the EF-pi Observational Framework. Honeywell’s JACE controller is a hardware device equipped with specific drivers and software applications that allow it to deliver open and modular end-to-end interoperability and data management, while the gateway component prescribes the required hardware for the establishment of the communication between the installed sensing, metering and monitoring devices in residential premises. The added value, in terms of interoperability comes through the integration with the Observational Software Framework, described next, and the resource managers, which will be discussed in the next subsection. TNO’s Observational Framework, an accompaniment software module to their EF-pi suite, offers the required communication drivers and applications in order to enable the recording of parameters and measurements of the sensing and metering infrastructure. Finally, the middleware serves as the central communication and data storage hub of the HOLISDER framework, consisting of an open platform and application software framework that will establish transparent and homogeneous standards-based interfaces to all integrated HOLISDER components. The Holistic Demand Response Optimization and Control Dispatch DSS Layer comprises two main managers, the Local Demand Manager (LDM) and the Global Demand Manager (GDM). The main objective of the GDM is to offer the required processing and analytics engines, which, through the appropriate user interfaces, will expose the necessary functionalities to the retailers and the aggregators. Supplementary, the LDM implements the profiling and control engines, which are needed on the building level, in order to allow the implementation of DR schemes and engage the end consumers. Finally, the Visualization Platform and End-User Toolkit Layer consists of a variety of modules, which offer services and user interfaces (web, mobile) to the identified stakeholders of the project. In particular, four user interfaces are prescribed, a retailer app, covering the requirements of the energy utility stakeholder, an aggregator app, providing the (dis)aggregation and DR functions relative to the aggregator, a consumer app, tailored to occupants and building managers, enabling them to monitor and participate in DR, and finally, a predictive maintenance app, also addressing the needs of facility managers for real-time performance monitoring of the equipment and on-time notification in cases of degradation or damage. The report “HOLISDER Framework Architecture including functional, technical and communication specifications” presents the details of the HOLISDER framework, and furthermore delineates the workflow processes for each use case through specific sequence diagrams. Subsequently, the report concentrates on the presentation of the constituent components’ architecture, including the functional and technical requirements/ specifications, the application interfaces between them, and finally the details on the development view of the modules.